While there isn’t any hard evidence that Apple is planning its own take on a heads-up display, a steady trickle of patent applications surrounding the concept have kept speculation alive that the iPhone maker could release a product that will compete against the Google Glass project. The latest application from the Cupertino, Calif., company is titled “Display resolution increase with mechanical actuation,” Patently Apple reports. The filing is a mouthful of technical jargon, but the basic concept appears to be improving the resolution of an image without increasing the pixel count. The background of Apple’s application mentions that a “portable heads-up display” has size and weight restrictions that would restrict the amount of pixels. An included drawing of the invention shows a bulky helmet with a single-eye display. Assuming that Apple could bring the size down a bit, I’d definitely be interested in one of these, especially if it came with a targeting computer. 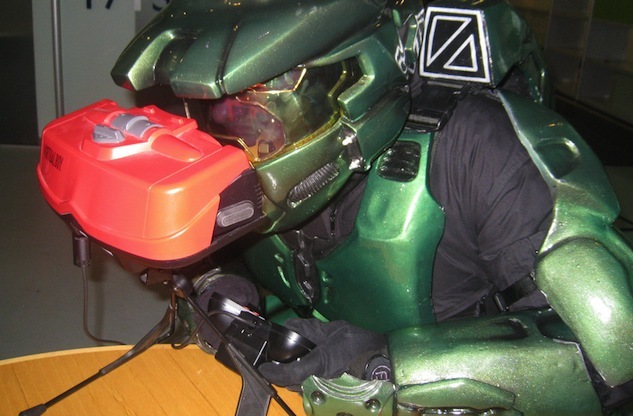 The company’s explorations into head-mounted displays date back to 2006. In early July, the US Patent and Trademark Office published an application from the company for “peripheral treatment for head-mounted displays. Of course, there’s no sense in getting our hopes up here, as Apple frequently applies for patents that don’t make their way into its products. But, if you’re looking to dream about technology that could be released in the near future, look no further than the aforementioned patent, which Apple says could apply to “television sets.” Let the speculation commence! For its part, Google wowed the audience at its I/O developer conference with a flashy demo of its Google Glass that involved wing suits, bikes and rappelling. Just a few days ago, co-founder Sergey Brin sent out a welcome email to developers who had pre-ordered test units, which are set to ship in early 2013. If all goes according to plan, consumers should be able to slate to get their hands on them sometime in 2014.